Baked peaches give you the same taste as a pie, but without the heavy, calorie-rich crust. Preheat oven to 400F and line a baking sheet with parchment paper or silicon baking mat. Combine lemon juice, coconut oil, sugar, and extract in a small bowl. Set aside. 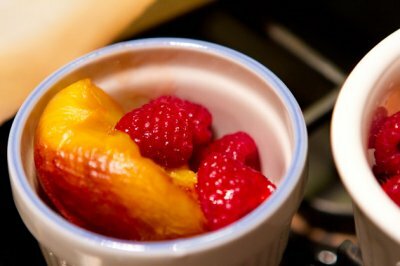 Place peaches in a large bowl and pour the sugar mixture on top. Make sure all peaches are covered. Lay peach halves face down on prepared baking sheet with lots of sauce underneath. Place in preheated oven and bake for 20-25 minutes until sauce begins to thicken and peaches are fork-tender. 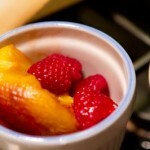 Serve in small ramekins with a sprinkle of fresh raspberries.